Born in East Windsor, Connecticut, Jonathan Edwards stayed close to home for his education, graduating from Yale College with a Bachelor of Arts in 1720. Upon graduation, he succeeded his father in preaching as a minister in the Congregationalist Church of Northampton, where he gained a reputation for being a firebrand evangelical and a prominent saver of souls. In his probably his most famous sermon, Sinners in the Hands of an Angry God, Edwards forcefully demonstrated man’s inherent necessity for the grace of God and established himself as one of the foremost preachers in colonial America. After his preaching career ended, Edwards turned to missionary work, spreading the Gospel to the Mohawk Indians in Stockbridge, where he continued to publish works prolifically. Edwards’ reputation as a preacher and educator caught the attention of The College of New Jersey, (now Princeton), and he accepted a position as president of The College continuing to expand the school and emphasizing its religious nature. As the third president of the school, he began his service in 1758. Barely two months into his tenure, became infected with a smallpox infection after inoculating himself against the disease to set an example to his students, and died shortly thereafter. Edwards’ contributions continue to reverberate throughout literature, religion, and American history. 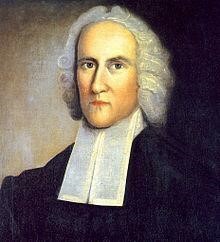 As the highest regarded American theologian in the First Great Awakening, Jonathan Edwards changed the landscape of American Protestant Christian thinking by developing a medley theology of Puritan theological determinism and views on divine beauty that predated English Romanticism by almost 50 years. Central to Edwards’ metaphysical approach was a defense and extension of Theological determinism, or the idea that every action that has taken place and will ever take place has done so under the direct control of God. According to Edwards, the nature of motivation necessitates that every action that has ever taken place has arisen because of some prior cause, and therefore truly free will is impossible, because no one is truly free from his or her causes. Despite being buried in Princeton, Edwards spent most of his life outside of New Jersey, travelling around the country, first in Connecticut, then to Native American tribes, then to various churches in America, and finally ending up in Princeton as President of the college. When he died, he was honored at the Princeton Cemetery by the faculty of the college and buried there.